We went to an estate sale in Magnolia this morning. 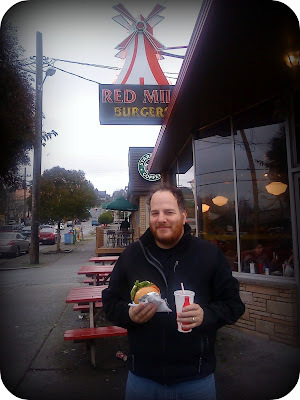 Dan was super excited because that meant we ate lunch at Red Mill Burgers. "One of the 20 burgers you must eat before you die." I had a veggie burger and onion rings and let me tell you, Oprah is one smart lady. p.s. The estate sale was in the cutest little home of a lady who collected all sorts of treasures that were right up my alley. I think she would be happy to know that I will cherish them and think of her often. Don't you? Oh, don't forget to sign up for the giveaway. You have till Wednesday. I've been to Red Mill twice in Seattle and YUUUUUMAAAAH! SO delicious! I love their banana shakes and Stuart loves their huckleberry shakes. Yump! that burger sounds so good right now. i feel like homer simpson when his mouth begins to water. we have a place here that makes the best onion rings and another the best fries with sauce. still searching for even a mediocre burger place. i'm with katrina. my mouth is watering! Thank you for the very sweet comment on my blog.